BodyCraft SPM Indoor Training Cycle is good in both quality and durability. It has some amazing features like heavy flywheel, heavy duty steel frame, three piece cold-forged steel crank and aluminum alloy pedals. It is fully commercial which make it popular among group and individual indoor training. Top quality seats is one of the attracting feature of this exercise bike and also has a max weight capacity of 300 pounds. The frame of this exercise bike, used at home comes with a lifetime warranty. Frame: Heavy duty steel frame, coated with Two-Phase process to prevent rust and corrosion. Flywheel: Precision, perimeter weighted 46 pound flywheel. Resistance: Patented friction-brake resistance for extra-smooth performance, and controlled by a micro-adjust safety knob with emergency stop. Drive: French-made Hutchinson 5PK v-ribbed automotive belt. Seat: Top quality, built for comfort saddle. Lower Bracket: Heat treated Cro-Moly axle turns on sealed SKF bearings. Cranks: Three piece cold-forged steel, 175mm long. Max User Weight: 300 pounds. The latest cost of BodyCraft SPM Indoor Training Cycle Exercise Bike will be updated soon. *Note: Most of the sites, stores or shopping portals listed above sell BodyCraft SPM Indoor Training Cycle Exercise Bike with discounts and other exciting offers. There is a possibility that the some of above websites are not selling BodyCraft SPM Indoor Training Cycle Exercise Bike now. Toughtrain.com is not liable for such cases or instances. 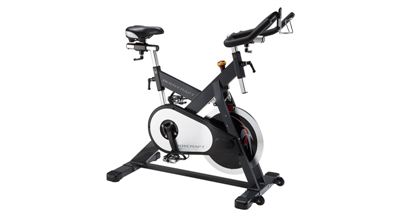 Also we do not recommend any seller for BodyCraft SPM Indoor Training Cycle Exercise Bike and a buyer should buy from where he/she gets best deal with quality of products, service and on time delivery (shipment).